The topic sentence is the main sentence of a paragraph, which describes its content and direction. It details the main controlling idea of the paragraph. It also sets the tone for the organization of the supporting sentences that further explain the concept established by the topic sentence. Considerations: Topic sentences state a claim that the supporting sentences later describe. It unifies the direction of the paragraph and its content. The point that is stated by the topic sentence is then extended with reasons and examples expressed in the other sentences of the paragraph. Function: Think of your main idea and summarize it in the form of a sentence. This is the topic sentence. Think about your supporting information and what you are actually writing about. Research your information and make note of the most important details of your topic. Put all the ideas together to form a concise, yet comprehensive, statement about your writing assignment. 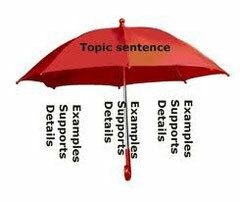 Placement: Topic sentences are most often written at the beginning of the paragraph. By writing it in the beginning, the writer is informing the reader of what is coming. However, in more creative writings, topic sentences may be placed in the middle or at the end of a paragraph.